I actually made this hat over a year ago, but never got round to writing the pattern up – and to be honest, I can’t even remember which yarn I used! I’ve since worked out that it’s an aran yarn, and I’m sure I remember it being part of a Debbie Bliss range that was being discontinued, but that’s all I know – I can’t find anything similar online, but I’m going to make another one in King Cole Fashion Aran in Orkney or Kintyre. 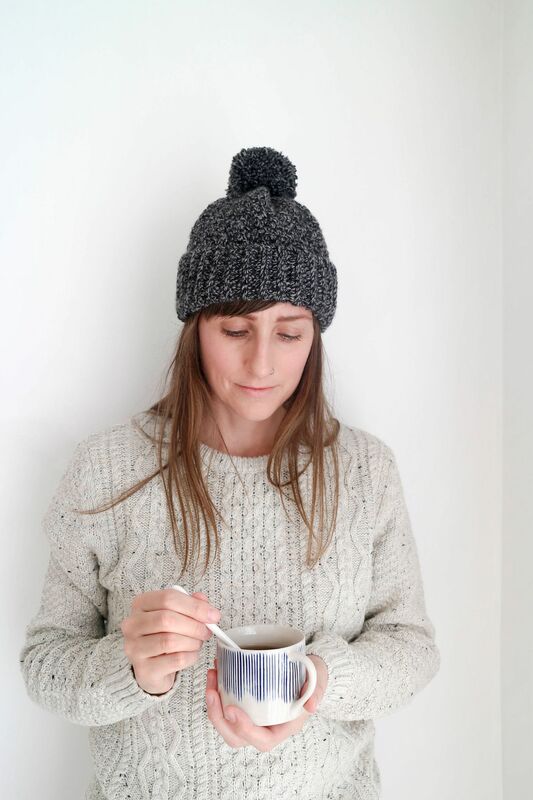 I had to take the bobble off, and needed to unpick the back seam but just about managed to work out the pattern – so read on for the easiest and quickest knit-look crochet hat! Using a 4.00mm hook, make 12ch. FR: Work 1dc into the second ch from the hook, then 1 dc into each ch along. Turn. R1:. Ch1. 1dc BLO into each stitch to the end. Turn. R2 – 66: Repeat R1 until you have 67 rows in total. Fasten off and weave in ends. R1: Holding the ribbed band vertically, rejoin the yarn to the top left corner. *Work 1 dc into the first row end, then 1tr into the next row end. Repeat * to the end of the hat band, ensuring the 66 stitches are evenly placed. R2 – 23: Repeat R1 another 22 times. Fasten off, leaving a long 30cm end. 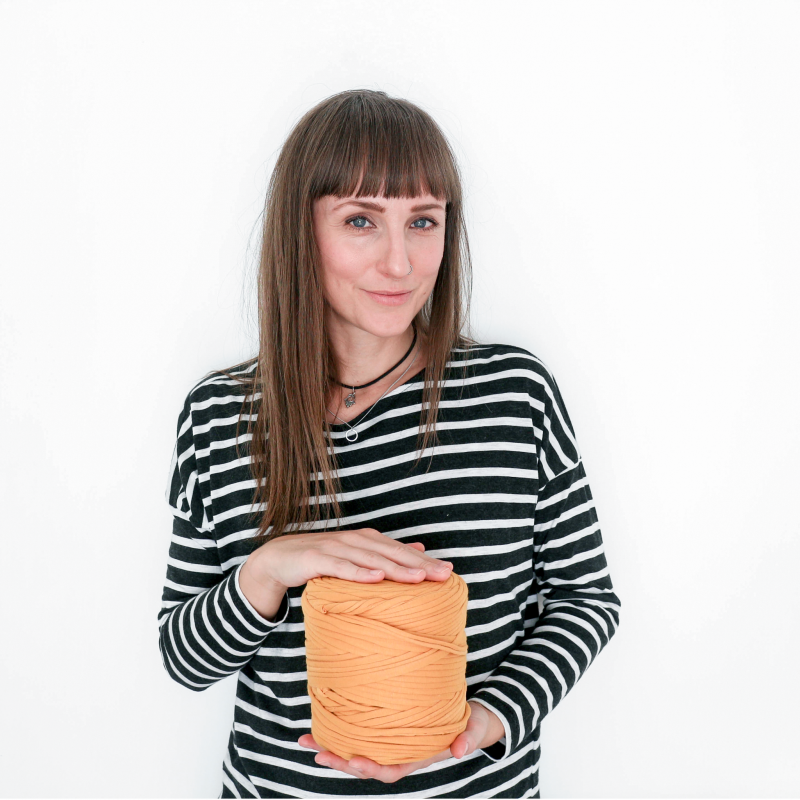 Fold the hat in half widthways, and sew the sides together to create the back seam. Using the long end left at the end of the body, weave it in and out of the top row, and pull tight to create the hat shape. 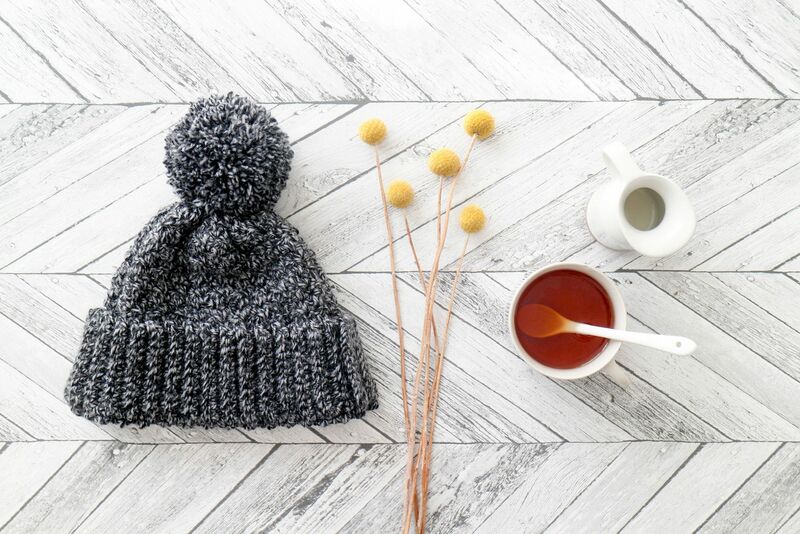 Fasten off and weave in, then make and attach a super-sized pompom.